The Silver Swan, 1774, created by John Joseph Merlin and James Cox. 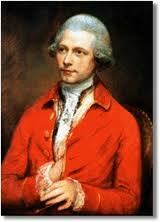 The eighteenth century was a time of magic and mystery despite – or perhaps because of – the Enlightenment. The more scientific, rational and demystified the world became, the more people sought out the shadows, the unknown and the extraordinary. From the passion for the Gothic Novel, to the vogue for seances and Phantasmagoria, the thrill seekers and the curious were desperate to be amazed. Science helped to fulfill this need, and Scientists became the new Wizards of the age – often just as good showmen and PR guru’s as any market-place mountebank. 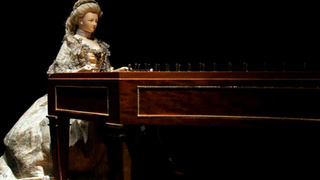 Automata were at the forefront of eighteenth century technological developments, yet they were also things of beauty and wonder that posed philosophical questions about the human condition. One of the most sublime and magical of the Automata, in my opinion, is the Silver Swan created by a later-day Merlin. Truly a master of mechanical magical arts – John Joseph Merlin (1735 – 1803) was an eccentric Belgian inventor who came Britain. Merlin was from an early age a genius with clockwork. He studied at the Academie des Sciences in Paris and at only 25 years old he was already a well-known inventor, so much so that he was brought to England by the Spanish Ambassador. He enthusiastically threw himself into the heart of Georgian celebrity culture, he had a knack for hanging out with the intellectual and artistic ‘in-crowd’ (Dr Johnson, Gainsborough, Walpole and JC Bach (son of JS) to name but a few). He also had a talent for publicity. One of his favourite publicity stunts was to attend soirees dressed up as a barmaid, whilst whizzing round the bemused guests on roller skates (also his invention) serving drinks – or playing the violin (he could do that as well –the smarty pants!). Note the wonderful eighteenth century emphasis on the damage to property prioritized over personal injury! Fortunately Merlin is said to have had a good sense of humour (and a strong constitution – one hopes). He was also noted for being very musical (hence the violin) and inventing and improving various musical instruments including a Barrel Organ for a princess and a compound harpsichord with pianoforte action which was used by Bach. The famous Silver Swan came about through a partnership between Merlin and James Cox. Cox was a jeweller and clockmaker with brassy flare of a showman. The perfect promoter for top end exquisite and exclusive Automata. 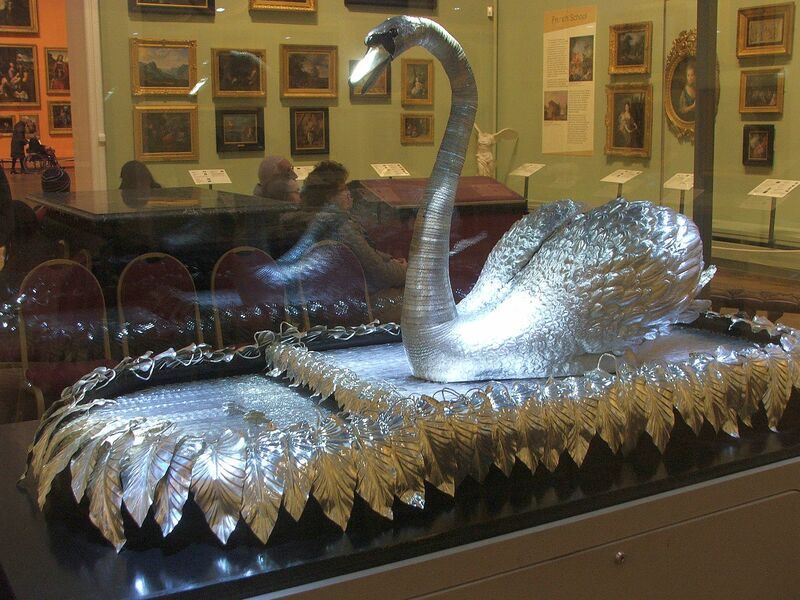 The Silver Swan, created in 1773, was a show stopper from the start drawing huge crowds to ‘The Mechanical Museum of James Cox’ in London. It was exhibited in 1867 at the Paris Exhibition, and bought by John and Josephine Bowes in 1872 for their museum in Barnard Castle. And that is where it remains to this day – as the star turn of Bowes Museum. The Swan is the ultimate luxury object – solid silver, with a top of the range clockwork mechanism and artistic touches such as the uneven glass rods that form the water in which the swan sits – Cox gave the Swan its beauty whilst Merlin gave it life. Imagine the swan in action in candle-light, flickering flames making the water shimmer as the swan inclines its elegant silvery neck, whilst eerie music plays from within its mechanism. In 1783, after Cox ran into financial difficulties, Merlin opened his own show room: ‘Merlin’s Mechanical Museum’; it ran with great success for a number of years. Amongst his clock-work masterpiece was a perpetual motion machine run by changes in atmospheric pressure as well as his famous automatons. Charles Babbage, inventor of an early proto-type for modern computers visited this museum as a child and was mesmerised by what he saw, and became hooked on the potential of automata. There was also a dark side to this beauty and technology. For much of the eighteenth century these beautiful and innovative creations were produced by highly skilled low paid workers. Artisans who worked by candle-light on tiny mechanisms. Many of them must have damaged their eyesight or gone blind. And of course, most ordinary people would never have been allowed to glimpse these marvels of the age as they were primarily for the entertainment of the wealthy elite. One famous maker – Pierre Jaquet-Droz even vowed that no servant would ever see his creations. Automaton owned by Marie Antoinnette, Versailles collection. Automatons were so much associated with the elites and ruling classes that during the French Revolution, revolutionaries likened the hated aristo’s to the automatons that they loved so much: “bodies without souls, covered in lace”. I think Mark Twain truly captures the essence of automata here, they were not just imitations of life, there was a growing philosophy that the body and machine could become one and be recreated in clockwork. Scientists and philosophers saw automatic movements and processes in the way the bodies of humans and animals worked and many automaton’s were designed to replicate these processes and in doing so posed the question were humans really any different from machines? These early Automatons also hinted at the industrial revolution and the mechanisation of many industries (such as the textile industry) which had a direct impact on the working classes. They were also very early precursors of the computer: automatons were directed in their actions by Cams, each cut differently, and capable of ordering the movements of the automaton. Often hundreds of cams were required, and as many were numbered, potentially an automaton could be programmed to perform a variety of tasks by rearranging them – a mechanical form of computer programming. They have also helped inspire and drive the creative imagination in literature and in science in the form of robots and androids. And reality is fast catching up with sci-fi with sophisticated robots such as Asimo, and the current debate about the possibility of creating ‘killer’ robots in the not to distant future. Unfortunately very few of the original automatons survive, and those that do, are often just as inaccessible to ordinary people as they were in the eighteenth century. However, it is still sometimes possible to glimpse one of these remarkable creations in action. 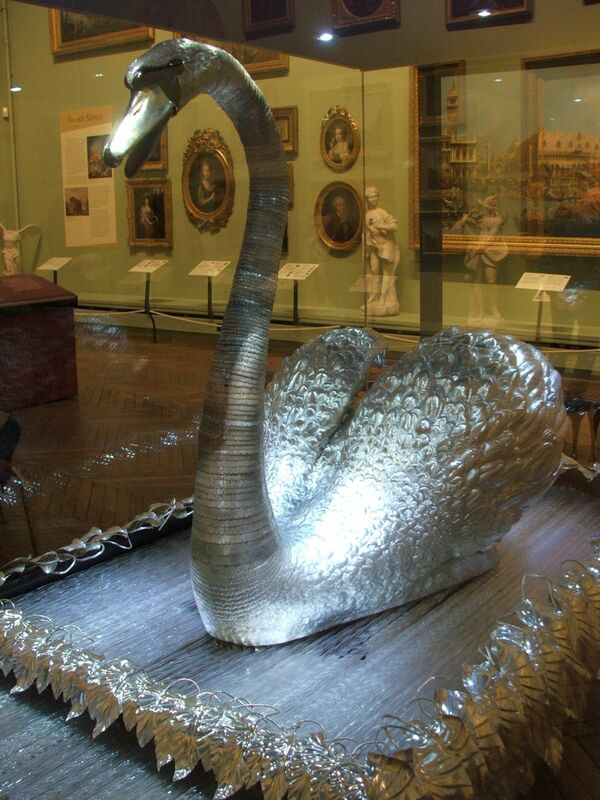 The Silver Swan at Bowes Museum, Barnard Castle, is operated every day at 2pm for the public. I have seen the swan in action, it is incredible to watch a clockwork masterpiece built 240 years ago working so perfectly. You can see it in action on You Tube on the link below, and details of how to visit can also be found below. Really interesting article If you like the swan you should look at the Peacock Clock in the Hermitage. It is about 3 metres high and in gilded bronze. It is incredible! I came across that when researching this article it looks stunning. If I remember rightly, James Cox was the creator of the Peacock clock – possibly before the time he and Merlin began to work together. I have never heard Psycho the card playing robot – thanks for the link – looks like a later version of the Turk. 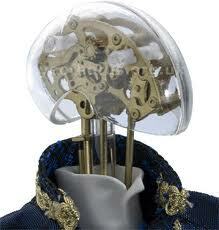 The Turk was an early 19th century automaton that played chess and beat everyone who challenged it. The Turk had a secret though (which I won’t go into, in case I decide to write about it!). Thanks Lenora. I can’t wait to hear more about The Turk ….and its secrets! So cool! Lots of potential for supernatural hijinks, too–sympathetic magic and whatnot. Some automata are so lovely – yet so sinister – especially the very human looking ones. You could quite think they were secretly up to something when your back was turned! Wonderful article Lenora, a fascinating subject brought to life by you 😉 I’m always a more knowledgeable person after reading your work and it is always a great pleasure to visit here. Class! Aww thank you – so glad you enjoyed the post! I am a total history geek and I am so grateful when people stop by and read my ramblings – and it’s fab to get such positive feedback!